Boil the potatoes until tender, about 30 minutes. Peel the potatoes and mash very well. Let cool slightly. Stir the egg yolks, grated cheese, parsley, and nutmeg into the potatoes. In a shallow dish, beat the egg whites until frothy. Spread the bread crumbs on a sheet of wax paper. 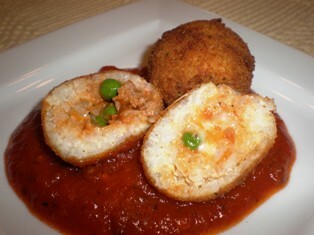 For each croquette, use about 1/4 cup of the potato mixture. Place the mixture in the palm of your hand and form a ball. 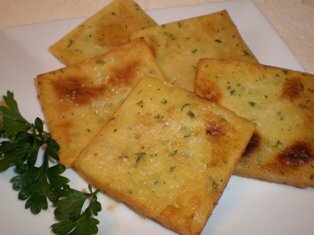 Make an indentation in the center and add a few cubes of mozzarella. Bring up the sides to cover the cheese. Form into a sausage shape about 1 inch thick by 2-1/2 inches long. 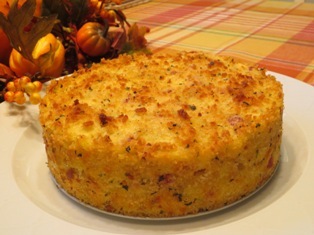 Dip the potato logs into the egg whites, then roll in the bread crumbs. Place the logs on a wire rack and allow them to dry for 20 to 30 minutes. Pour about 1/2 inch of oil into a large skillet. Heat over medium heat until a bread crumb sizzles when dropped in the oil. Place only enough of the croquettes into the pan as will fit without crowding. Fry them until evenly browned, turning occasionally. Serve immediately or keep warm in a low oven. Pototo croquettes are small cylinders of mashed potatoes combined with eggs and Parmesan cheese wrapped around a cube of mozzarella and then coated with bread crumbs and fried. The mozzarella melts during the frying process so that the center of each croquette is soft and the bread crumbs form a crispy outer crust. 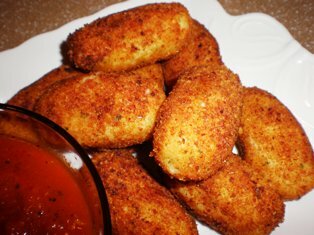 Potato Croquettes are nice as a side dish but can also be served as a snack with a small dish of tomato sauce for dipping. So versatile, you'll use it every day to make soups and casseroles, steam vegetables and rice, cook pasta, or roast beef, pork, and poultry. Deep fry six servings in the handy basket. The basket can also be used for steaming or blanching. Tempered glass cover; Fully immersible and dishwasher safe with the heat control removed. Makes perfect mashed potatoes every time. Also great for making baby food or mixing together a variety of vegetables.